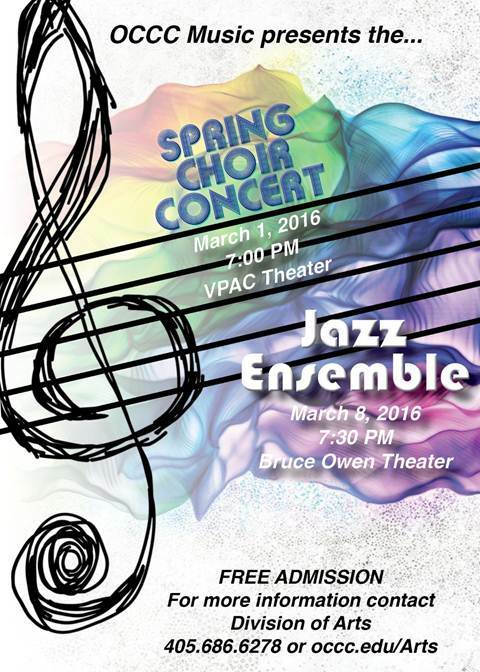 As the spring semester begins to get serious, so does OCCC’s choir program. The choirs are bringing the Big Apple to Oklahoma City for their show at 7 p.m. Tuesday, March 1, in the VPAC theater on campus. The vocal music program is home to three choirs. The Concert Choir and the Chamber Singers meet for one hour on Monday, Wednesday, and Friday. The Chamber Singers is an audition-only student group, while the Concert Choir is comprised of all students who enjoy singing. “We have about 20 students in the Concert Choir, and about 22 in the Chamber Singers,” Staton said. The Symphonic Community Choir meets for two hours on Monday nights. It is made up of 85 vocalists from the community. Along with the choirs, Staton said, he also teaches Music Theory classes I, II, III, and IV, as well as private piano. Staton has been teaching at OCCC for 14 years and said he loves watching students strive to be better performers. “My favorite part of teaching choral music is to set high standards and watch students really strive to reach them,” he said. Before coming to OCCC, Staton taught at Del City High School for 35 years. “All together, I’ve been teaching for 47 years,” he said. Admission is free to “A Night on Broadway,” which will feature all three choirs. The VPAC theatre can seat 1,049 individuals. “If people enjoy Broadway music, they’ll have a great evening,” Staton said. For more information on any upcoming performing arts events or for details about courses, visit www.occc.edu/arts/companies.html .